Two Leeds Trinity University students have been given the chance to get a sneak preview of the specially made gown to be worn by the University’s first Chancellor, Gabby Logan, at her formal installation ceremony in June. 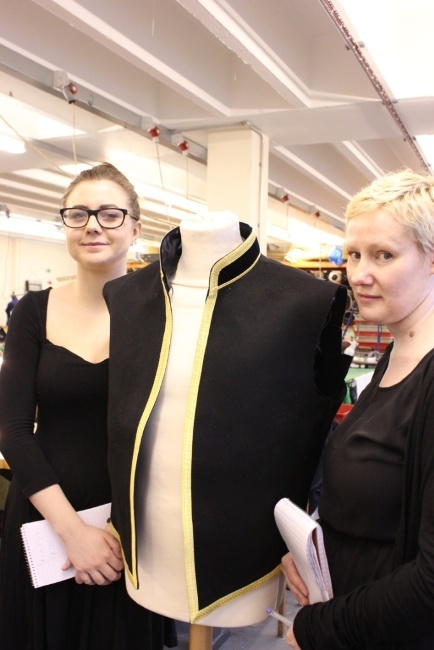 Postgraduate journalism trainees, Samantha Hepworth and Sallie Gregson, were invited to the textile factory of Samuel Brothers in Leeds, who are currently in the process of cutting the final garment. 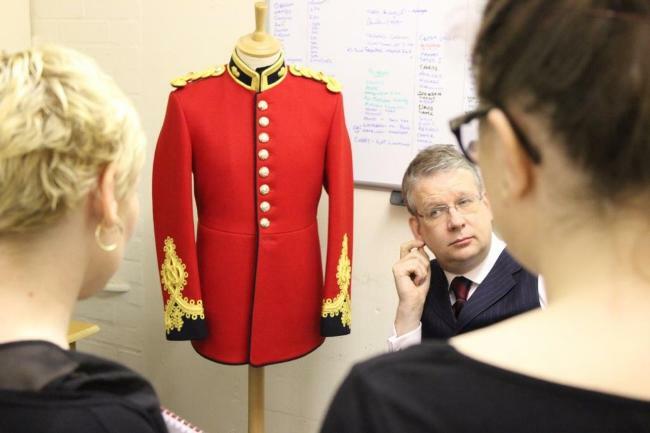 The trainees had the opportunity to interview Lee Dawson, Samuel Brothers’ managing director, go on a tour of the factory and be one of the first to receive a look at the one-off bespoke gown that will be worn by the famous TV presenter. Leeds-based graduate designer, Kate Duckworth, was selected to design the gown and production has taken place at the landmark site of Leeds manufacturing, Armley Mills. The gown is being made with cloth from Hainsworth, who have manufactured fine textiles in Leeds since 1783, with the final cut and finish taking place at Samuel Brothers, the military tailors in Leeds established in 1830. ​Gabby Logan will unveil the gown at the Chancellor’s official installation ceremony which takes place on Thursday, June 6, in Leeds Trinity University’s Chapel, where family, friends and representatives from the region and the University are invited to join in the celebrations. “We were delighted to be given the opportunity to see the gown in production and meet some of the key people involved in this process. As a postgraduate journalism trainee, seeing how this gown has evolved is a real success story for the region. “On behalf of the University, I’d like to thank Samuel Brothers and Leeds Fashion Works for arranging this visit for our students. For them to see this unique process unfold is a great experience and provides them with an incredible story about Yorkshire heritage and history.